Fearless. Not intimidated by anyone. 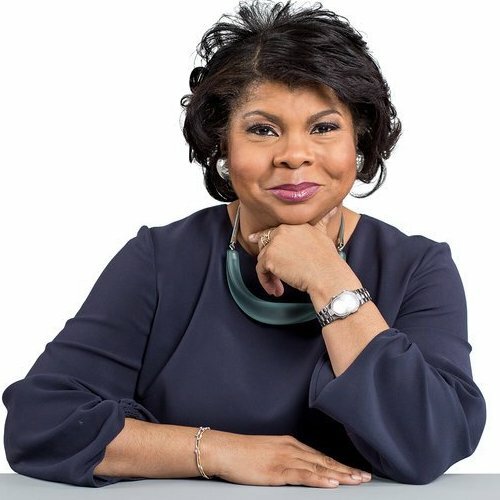 That’s how former White House Press Secretary Jay Carney describes April Ryan, the White House Correspondent and Washington bureau chief for American Urban Radio Networks and a political analyst for CNN. Over the past two decades, Ryan has been a leader in political news reporting. As one of the only black female journalists covering urban issues from the White House, she reaches an audience of millions with her reporting that sheds light on social issues like racism, equitable opportunities, intersectionality and more. Across four presidential administrations, she’s covered key news moments in the U.S. and abroad, among them Hurricane Katrina and its aftermath, U.S. support for democratic elections in Haiti, multiple presidential missions in Africa, and President Barack Obama’s inauguration and visits to Mexico and Trinidad. Ryan’s faced a unique set of threats while reporting in the White House under the current administration. The rhetoric used by the president led to people questioning her credibility, calling her names, and treating her differently as a black female journalist. She’s even received death threats. Still, Ryan refuses to back down. “I’m confident that all of us, including the African American women covering this White House, will continue to do our jobs no matter how we’re treated by President Trump,” she wrote for The Washington Post. 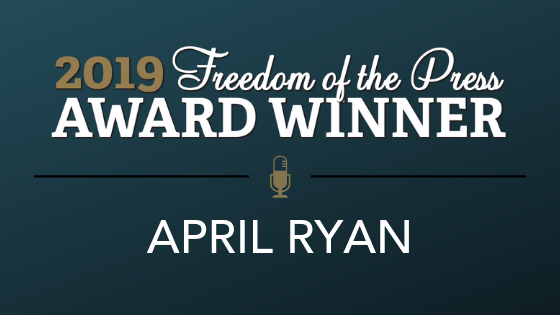 For her dedication to journalism and deep commitment to values of the First Amendment and press freedom, the Reporters Committee for Freedom of the Press will honor Ryan at the 2019 Freedom of the Press Awards in May. Those who have worked with Ryan say she’s a strong advocate for the public. Bloomberg White House Correspondent Margaret Talev said Ryan work also initiates important conversations in the White House press briefings. Ryan’s colleagues say she’s focused on asking the questions the public seeks answers to — and that she won’t take no for an answer. “She’s dedicated decades of her life to understanding the questions that are important to her audience and demanding answers of people in power so that she can empower her audience,” Talev said. “When April is asking questions, often times she can cut right through the B.S. of any press secretary or president, and I think that’s why she gets real answers from those people,” said Jim Acosta, CNN’s chief White House correspondent. The Baltimore native attended Morgan State University and graduated with a degree in broadcast journalism in 1989. From there, she worked in a variety of newsrooms and radio stations in Baltimore, including WXYV-FM, where she was the news director. Ryan also started The Fabric of America, a news blog dedicated to and offering the unique, urban and minority perspective in news. McCurry said Ryan’s work has played an important role in amplifying the voices of marginalized communities. Talev also said honoring Ryan with a Freedom of the Press Award is not just a recognition of one reporter’s work and advocacy for press freedom, but has a wider impact for journalism. In addition to Ryan, the Reporters Committee will recognize NBC News Chief Foreign Affairs Correspondent Andrea Mitchell, The Wall Street Journal Investigative Reporter John Carreyrou, and Atlantic Media Chairman David G. Bradley with 2019 Freedom of the Press Awards, as well as honor the founders of City Bureau — Harry Backlund, Andrea Hart, Bettina Chang and Darryl Holliday — with the second annual Rising Star Award.